Does meditating allow us to quiet the storm in our minds? After meditating this morning, I noticed that I felt calm and that my thoughts were more in tune with what I wanted to accomplish. My thoughts also seemed more quiet and peaceful as well. I am usually a pretty calm guy anyways…but this morning was different. 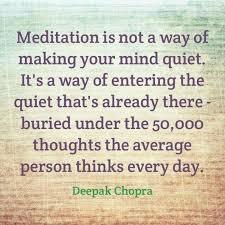 Could one of the benefits of meditating be being able to quiet the “storm” in our minds? ← What can we learn from Meditation?